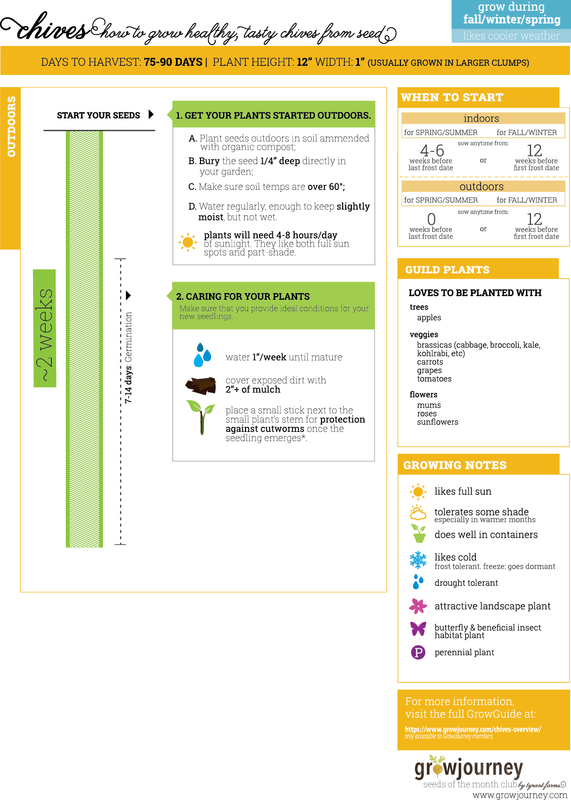 Pint-sized and Simple: GrowJourney Contents - October 2015 + Get Your First Month Free! 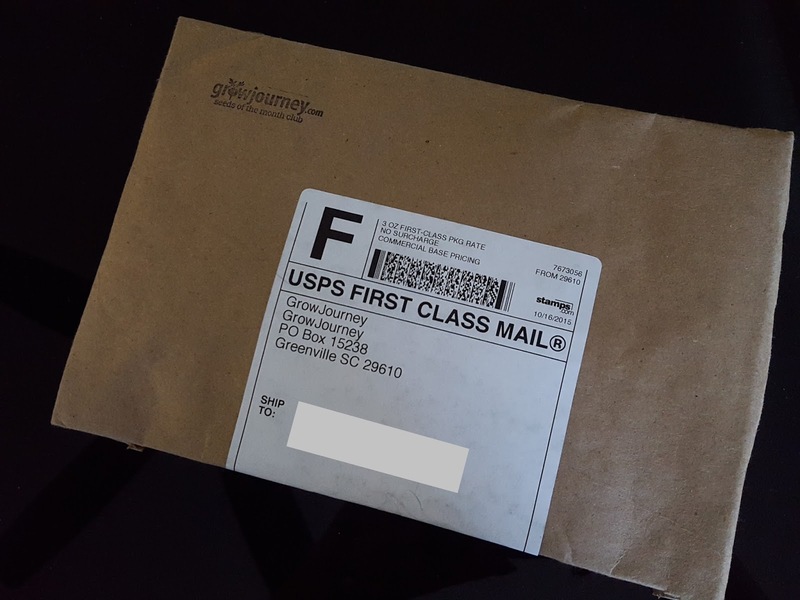 GrowJourney Contents - October 2015 + Get Your First Month Free! What: GrowJourney contains 5 packets of organic seeds to help you grow your own edible garden! Cost: $11.99-$14.99 per month depending on your subscription plan. Price includes shipping. 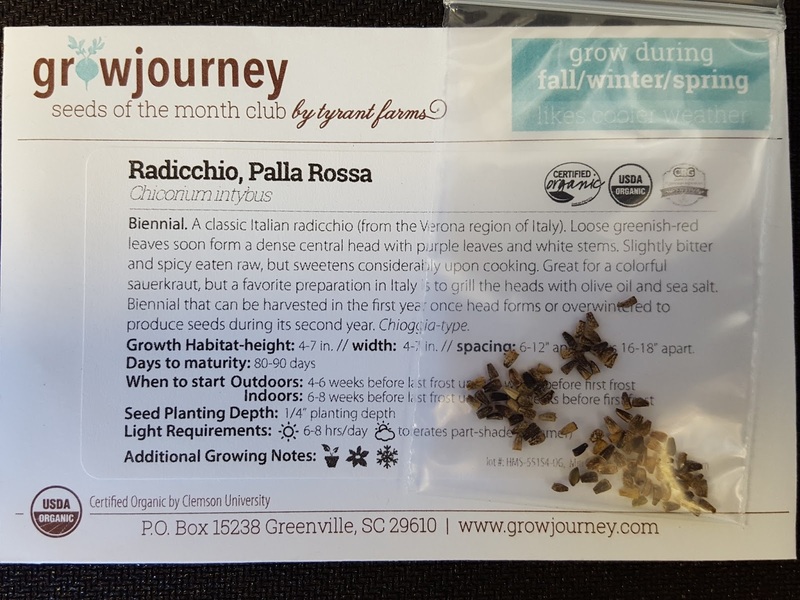 Fun Fact: Each packet of seeds contains 10-20% more seeds than you'd find in retail stores! 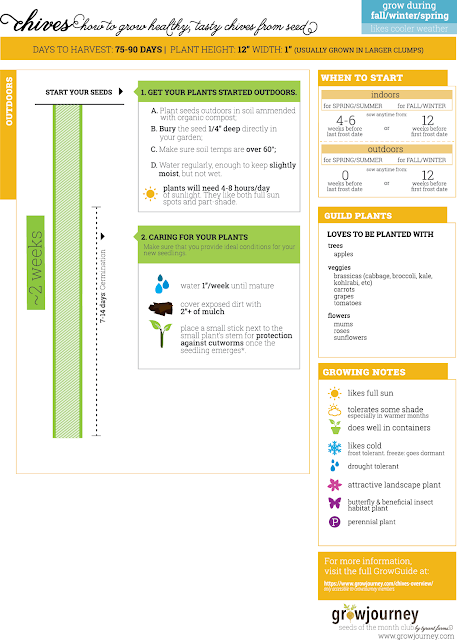 Hey gardeners (and wannabe gardeners)! 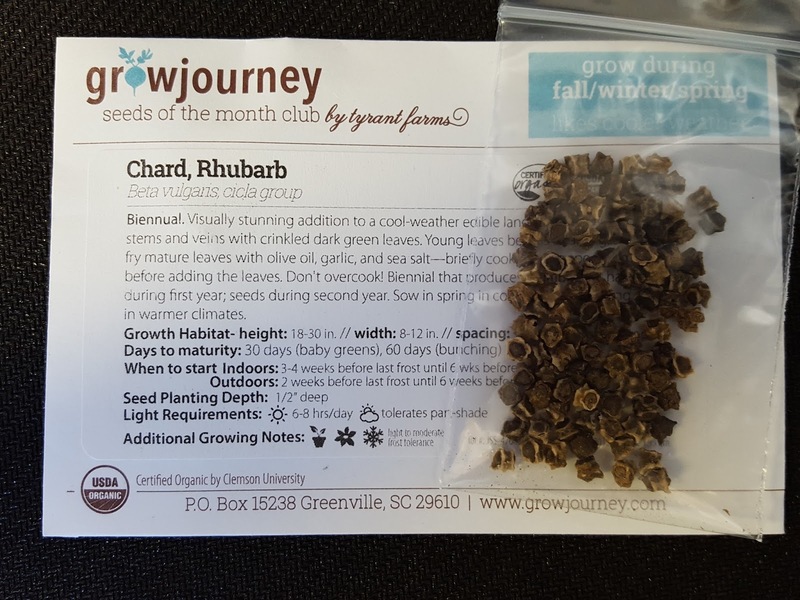 Here's a new seed subscription for you. 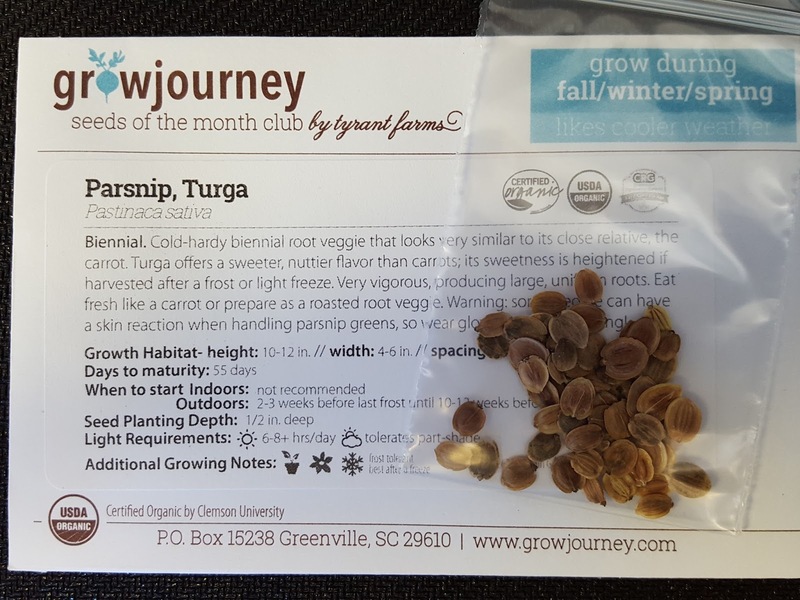 GrowJourney is a USDA-certified organic Seeds of the Month Club run by Tyrant Farms, an actual backyard organic farm owned by a couple whose goal is to save money by growing their own food. Well, they've succeeded and are now sharing their wealth of knowledge and organic practices with you and me. I am by no means an expert gardener; in fact I think I end up killing more than half the plants I try to grow. But the concept of growing my own garden sounds so fun. It's like earning your own food. 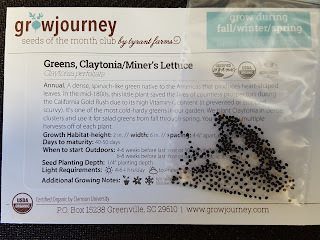 I stumbled across GrowJourney while reading the comments for a review of another plant sub and thought it looked interesting. 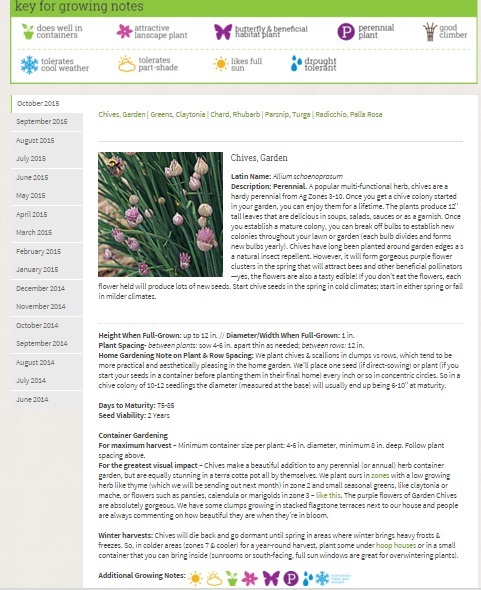 The GrowJourney website is well-designed and easy to navigate with lots of helpful info. I could definitely benefit from having a comprehensive plant-growing resource at my fingertips. So here I am with my first box. 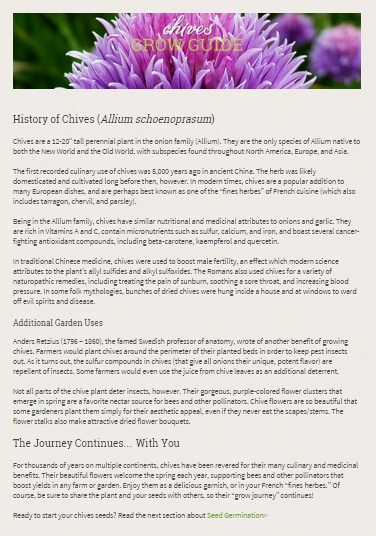 Click on the photo and another page pops up with background info on the plant. Parsnips are like white carrots but sweeter. It's one of those plants I always read about but never ate. I want to now; I love carrots. From what I hear carrots like cooler weather and do horribly where I live. Several different friends have tried growing carrots and all have failed miserably or at best gotten a cute little 4" root. Since parsnips are similar to carrots so they too like cooler weather. 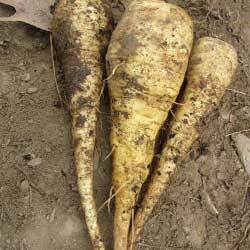 In fact, parsnips are sweetest when harvested after a frost. That will never happen on this rock. 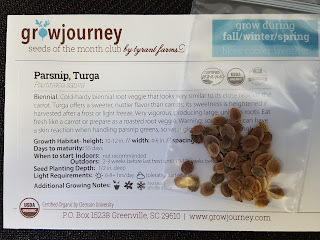 It rarely gets colder than 60 degrees even in the wee morning hours :( But this is supposedly one of the most vigorous varieties available, so maybe I can get at least a tiny root out of it. Wishful thinking? Finally, something that I can grow and not kill! Chives are a hardy perennial herb (I can totally vouch for the "hardy" part) that can tolerate both cold and warm climates. 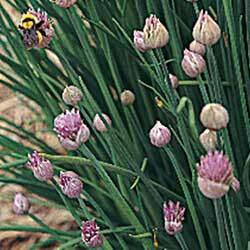 People say that once you put chives in the ground they spread like crazy. I've had it in the ground for the past two years and so far the plant's gotten bigger but no spreading of seeds anywhere. I usually don't let it flower because the stalk gets really hard, but yet the flowers are so pretty! This is one herb that I will always always keep in my backyard. I use chives interchangeably with green onions in my cooking (because C can't tell the difference and my chives grow so much better) and I use it regularly. Plus the effort:payoff ratio is close to zero and since it's a perennial I don't ever have to worry about replanting. It's a lazy gardener's dream come true! I think I'm beginning to realize how fun plant subs are because like beauty sub boxes, you get things you'd never think of growing. Take chicory, for example. Honestly, I've never eaten or even seen chicory before. It's a cooler weather plant so you don't normally see it growing in the wild in Hawaii. 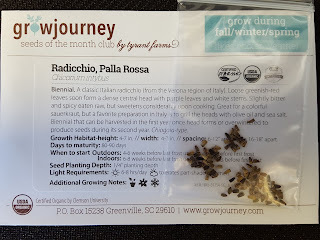 So I'm gonna use that as my excuse for not knowing there were so many C. intybus varieies :-P We got the Palla Rosa variety this month which is similar to Chioggia Radicchio and looks a bit like a small head of purple cabbage. I love purple cabbage, but radicchio is bitter when raw and gets sweeter when it's cooked. 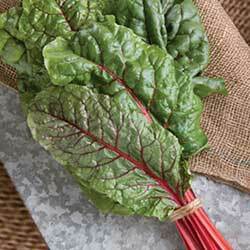 It's one of those great plants that is entirely edible - leaves, flowers, and roots. 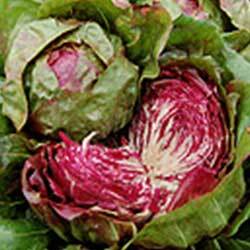 Palla Rosa is one of the more hardy varieties - unlike most radicchio varieties which grow only in the cooler months, it can withstand the warmer spring season as well. I highly doubt it'll be able to tolerate spring (or even winter) here, but I guess it's worth a shot. Similar to spinach, Claytonia (aka miner's lettuce) grows in low, dense patches with tiny flowers poking out of the leaves. During the California Gold Rush, miners ate it for its high Vitamin C content which helped in preventing scurvy. 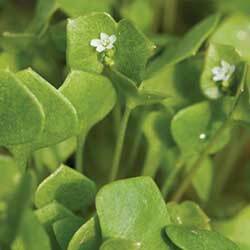 Claytonia leaves are crunchy and great in salads. The plant requires temperatures between 50-55˚F to germinate, so unfortunately I won't be able to grow it at my house. I live in the warmest part of the island; in the past three years since I moved here it hasn't dropped below 65˚F. Perhaps I can pass these seeds along to a buddy who lives up in the mountains where it's a bit cooler. Try GrowJourney for youself! Sign up and get your first month free (just pay $3.99 shipping). If you don't like it you can cancel right from your dashboard. I'll be the first to admit that $14.99 for five packs of seeds is a bit steep, but what I like about this company is that they did all the research for you. All you have to do is log in and you can find background info on your seeds as well as helpful guides to get the most out of them. And to me saving time is worth the extra few cents per seed packet. Note: I pay for this subscription and all opinions are my own. Post doesn't contain any referral links. Ten hours of sun?! /weeps I want that!! I'm with you on the Chives. I love how easy they are to grow. Mine spread in a clump fairly quickly. I always let mine flower but haven't had any issues with it spreading beyond the clump. I wouldn't mind if it did, chives are pretty! And tasty. Hi Sheri! Thanks so much for the open and honest review of our product and service. My wife and I are the cofounders of GrowJourney and I'm the CEO (she'll always be my boss though :)). You've identified one of the key challenges that we're planning to be able to overcome in the next year: members in "extreme" climate zones like Hawaii, Maine, etc. We're working on it, though. 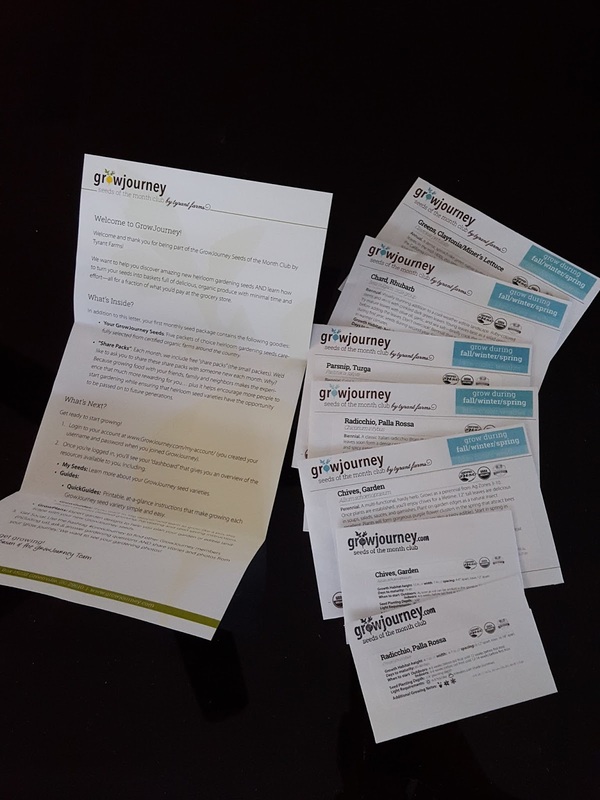 Please know that, as a member, if you get something that you don't think will grow in your zone or you really don't like, just email or use the chat feature on our website to let us know and we'll send you a replacement variety free of charge. Oh, and on the cost: if you price out certified organic heirloom seeds, you'll find that we're actually quite reasonable. If you get one of of our annual or 6 month plans, you'll pay a good bit less (10-20%) than you would if you were to buy our seeds from another certified organic seed company. 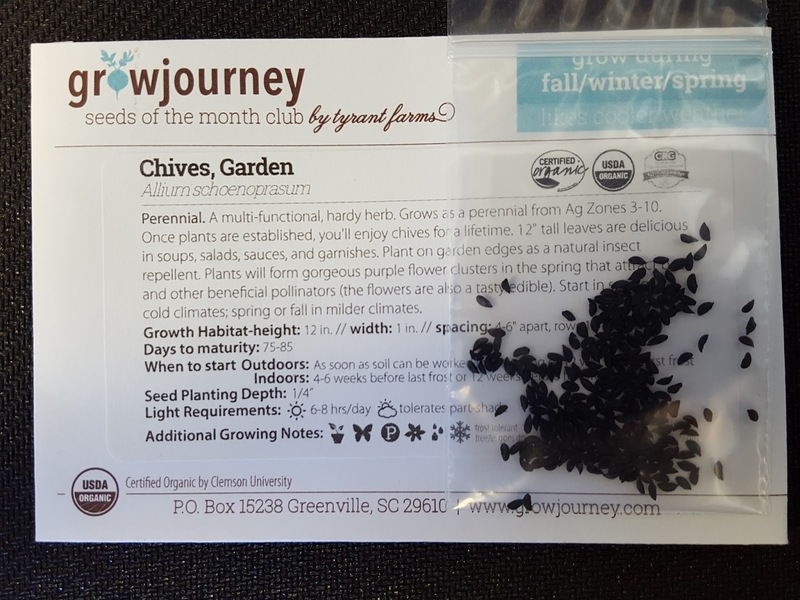 Plus, you get to try us for free for a month, so you get the first seeds at no cost other than the $3.99 that covers our shipping & handling. Plus plus we give you free share packets, although we'd really like you to share those rather than keep them. And as you already mentioned, we're not just offering a product (seeds) we're also offering the educational resources to teach you how to grow them using the best organic/permaculture methods available.